Bloomberg Sports Anchors Julie Alexandria and Rob Shaw break down some of the major storylines in baseball as the trade deadline approaches. The Dodgers made a splash by acquiring former Marlins sensation Hanley Ramirez for Nathan Eovaldi and a willingness to take on Ramirez’s salary. First of all, this is the way it should be for Los Angeles. The Dodgers are supposed to be the West Coast Yankees, so it’s good to see them open the check book to bring in some star potential. The move also makes baseball sense. The team already has two of the best hitters and pitchers in baseball, so it’s not a bad idea to go for the gold now. Eovaldi is too young to be depended on, while, even at his worst, HanRam is scoring runs and offering some pop and speed. On a side note, of all stadiums where Ramirez has played at least 65 games, his .388 average at Dodgers Stadium is easily the highest. With 19 home runs and 58 RBI, Alfonso Soriano is once again a solid slugger at the big-league level. He is also due to make $18 million in each of the next two seasons. His high performance provides the Cubbies with a window to trade him. Ken Rosenthal reported that at least one team has interest in the veteran outfielder. The Phillies are in a very interesting situation right now. They have some very bad contracts, though their huge investment in Cole Hamels is not one of them. He is still young at 28 years old and was developed within the Phillies system. The team is out of contention this season and must rebuild in the next few years. The only way players such as Shane Victorino could be dealt is if the Phillies get back prospects who will be ready to start next year. After a great first half, the Mets have won just one game since the All-Star break and could try to make a move. Johan Santana’s injury hurts them, as he is due so much money andcould have been traded. The Mets would have been happy to deal him in return for prospects. With Santana injured, if there is a Mets player to be traded, it’s infielder Daniel Murphy. Jordany Valdespin has been incredible this season and offers more versatility and better defense than Murphy. However, the Mets will only make a trade if they get something back which they are really able to use, such as a power arm for the bullpen. The Brewers have been buyers recently, bringing in players such as Zack Greinke and Aramis Ramirez, but it has not worked out. The best case scenario for them is that Greinke decides to stay in Milwaukee, which may not be very realistic. The Brewers were also shopping reliever Francisco Rodriguez and tried to increase his value. K-Rod, however, imploded with blown saves in consecutive appearances against the Phillies, likely costing the Brewers some prospects. Bloomberg Sports Host Julie Alexandria and Bloomberg Sports Analyst Rob Shaw visited Jupiter, Florida to preview the Miami Marlins 2012 season. This is very much the start of a new era for the Marlins, as the team moves into a new state-of-the-art ballpark, changes it’s jerseys, as well as it logos and colors. However, the greatest difference that will be felt on the field is the addition of Mets legend Jose Reyes to the top of the Marlins lineup. The leadoff hitter plays a very important role in baseball as the table setter for a lineup. Reyes is coming off a season in which he led the National League with a .337 average, while reaching base at a .384 OBP. Despite missing 36 games (more than 20% of the season), he still racked up 101 runs. That number should go even higher now that he joins a lineup batting in front of perennial MVP candidate Hanley Ramirez and several other rising sluggers. In truth, the Reyes impact is felt more than just at shortstop. By moving Ramirez to third base, he fills a void at a position that did not get much production last season. Suddenly, the fish have one of the best left-infields in baseball while also enjoying a top leadoff hitter in the lineup. Despite some frustration that the Mets did not make him an offer, Reyes is excited about his new team. “It’s been unbelievable so far, everybody has welcomed me like I’m home here, and that’s made me feel very comfortable,” said the star shortstop. With Reyes getting on base before Ramirez and slugger Mike Stanton, the Marlins should have one of the elite offenses in the Big Leagues, while the defense also gets an edge. Now if Josh Johnson can stay healthy they will have a shot at surpassing the Phillies. However, that is a big “if,” as Johnson has only once made 30 starts in a season. For more Major League Baseball insight visit BloombergSports.com. It’s not a bad time to be Jose Reyes’ agent. The Mets shortstop was supposed to be a middle-tier free agent well behind Prince Fielder and Albert Pujols this off-season, but instead the speedster may be the most in demand. Reyes is on pace for some pretty historic statistics: 130 runs, 30 triples, 60 steals, and a .352 average. Mets owner Fred Wilpon said early in the season that Jose Reyes was nuts for expecting Carl Crawford type money. It turns out Reyes would be crazy to accept Crawford-type money. He is younger, plays a more difficult positions, and this year proved that he has a higher ceiling than the Red Sox outfielder. Entering this season Asdrubal Cabrera had never before hit as many as seven home runs in a season. At the half-way point in the season, he is currently sitting on 13 dingers with 47 RBI, 12 steals, and a .296 average. Just 25-years old, Cabrera is thriving for the surprise Cleveland Indians. While the career-season is impressive, it is not necessarily shocking. After all, Cabrera did belt 42 doubles in 2009 despite missing 31 games due to injuries. Coming into the season a hot debate was who to draft with the first oversall pick Hanley Ramirez or Albert Pujols. As it turns out neither big talent has been worthy of the top pick. 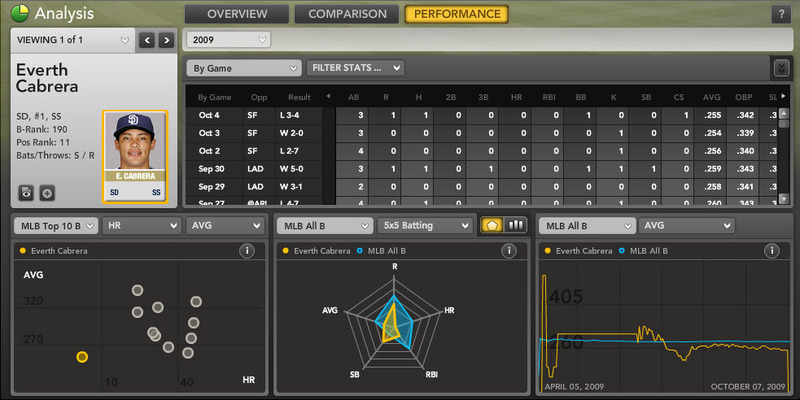 While Pujols struggled then endured a fractured wrist, Hanley Ramirez has been downright awful. Ramirez took a minor step backwards last season, as his average slipped from .342 to .300. However, no one could have predicted that his average would decline to .221 mid-way through the season. Ramirez has at least shown some signs of life over the last 10 games raising his average 21 points. However, it will take a major bounce back over the next few months for Ramirez’s production to return to its normal standards. Stephen Drew has always been a strong second half batter. In fact, his .282 average following the All-Star break is 20 points better than his career first-half statistics. At the moment, Drew is having an up-and-down season. Drew’s 43 runs and 43 RBI are solid, considering he spent the first week of the season injured. However, his five home runs and four steals are a bit pedestrian considering this a player that blasted 15 home runs with 10 steals last season. Expect Drew to heat up as the season progresses, perhaps reaching 100 runs and 100 RBI by season’s end. What happened to Hanley Ramirez? Why is a .310 hitter batting just .197 on the season without a home run? – What’s the big difference between last year and this year? 46 of the 327 pitches that have been thrown his way are right over the middle of the plate waist high and he is batting just .273 with a .364 slugging percentage thanks to just one extra base hit (a double on a fastball against John Lannon) in 12 at bats. In comparison, last season Ramirez faced 323 pitches right over the middle of the plate and he batted .326 with a .612 slugging percentage. – Conclusion– He is not punishing the pitches he should hit. – As far as the outpitches, how’s Hanley handling those? Ramirez has historically struggled against off-speed pitches. Last season, he hit just .245 against non fastballs. However, they only threw those pitches 39% of the time. This year, they have thrown Ramirez off-speed pitches 40% of the time, but there are two major issues, number one, he’s not hitting the fastball. The very pitch he hit .361 against in 2009, and .336 in 2010, Ramirez is hitting just .262 in 42 at bats. – Is there anything different about the fastballs thrown to him this season? The answer is yes, they are coming in at 91.2 MPH, compared to 90.5 MPH in 2009 and 90.7 in 2010. – And then there is the change-up, a pitch Ramirez has yet to get a hit again in 10 at bats. – Conclusion– He is struggling more than ever against the off-speed pitches, but he is also not hitting the pitches that we’d expect him to hit, considering he is just 27-years old and has not suffered an injury, Ramirez should bounce back. What’s the difference for Lance Berkman? – Lance Berkman is not just good, he has been perhaps the best hitter in all of baseball with a .410 average, 8 homers, 22 runs, and 22 RBI. Why is it such a surprise for the perennial All-Star, well first of all he is 35 years and second, he is coming off his worst season, when he hit just .248. – Is it a move to St. Louis? No, Berkman has all eight home runs on the road this season in 11 games, though at home he is batting .432. – So how can you get him out? Throw the ball low, as in below the strike zone, he has yet to get a hit in 5 at bats against those pitches. And paint the corners. When the ball is thrown over the heart of the plate, Berkman boasts a .421 average and .895 slugging percentage. – When he’s batting from the left side, throw the ball inside, he boasts just a .273 average on inside pitches. When he’s batting from the road side, he has yet to get a hit above his waist. – Conclusion– Berkman has been incredible, and you can’t really pitch around him with Pujols and Holliday before him and Colby Rasmus after him. The pitchers have to paint the corners, otherwise, just wait for the veteran to cool down. King of the Fantasy Shorstops: Troy Tulowitzki or Hanley Ramirez? In a recent fantasy baseball industry draft put on by FOXSports.com, your faithful Bloomberg Sports correspondent had the third pick. Going into it, I figured I would be fine with either of the great shortstops at the top of the draft – a five-category offensive player at the most difficult position is a nice way to start your team. True to my preparation, Troy Tulowitzki went second and I quickly clicked Hanley Ramirez with a smile. What would I have done if I had been faced with the second pick, though? Last year, the contributions in the fantasy categories may have barely favored the Floridian. Tulo put up a .315 average with 27 home runs, 11 stolen bases, 89 runs and 95 RBI. Hanley hit .300 with 21 home runs, 32 stolen bases, 92 runs and 76 RBI. While the batting average statistic looks like a notch in Tulowitzki’s belt, Ramirez actually accrued 15 more hits than the Rockies shortstop. At issue was the fact that Tulowitzki was hurt for a month and only came to the plate 529 times, vs. Ramirez’s 619. Give Ramirez a tiny nudge for crossing the 600 PA threshold for the fifth time in as many years, and he gets the overall nod, too. Obviously, it’s close. 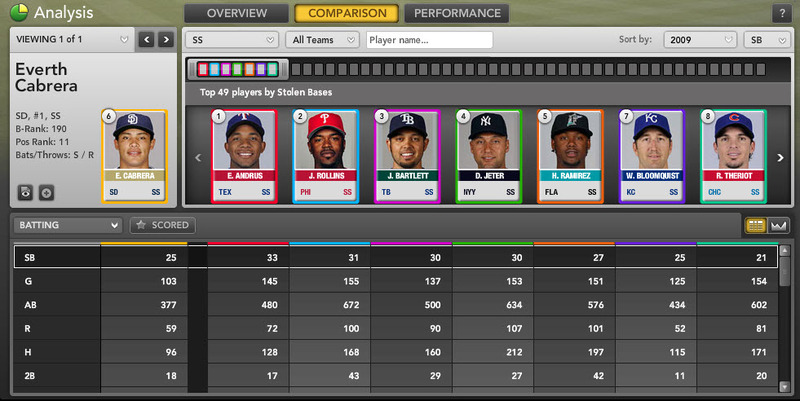 Some of the difference will come from how you value stolen bases. Even coming off his peak (51 stolen bases in 2006-2007), Ramirez has averaged more than 30 per season for three seasons. While it’s tempting to pencil Tulowitzki in for 15 stolen bases or more next season, it’s worth noticing that his success rate is not impressive (62.6%). That means that he’s below the break-even point (you want to be successful at least two-thirds of the time, value-wise) and may get the green light less often. Two hand injuries in the last three years might also discourage his coaches from sending him. So we turn to next year and the projections. Bill James has Tulowitzki down for a .296 batting average, 27 home runs, 11 stolen bases, 96 runs and 93 RBI in a virtual carbon-copy of his 2010 effort (though in 597 plate appearances). He has Ramirez bouncing back from a three-year decline in isolated slugging percentage, as he thinks the Florida shortstop will put up a .312 batting average, 25 home runs, 33 stolen bases, 108 runs, and 80 RBI (in 658 plate appearances). If these projections hold, Ramirez is an easy pick. The last caveat is that the 26-year-old Tulowitzki is obviously on his way up, while Hanley Ramirez has shown a decline in some key statistics. After putting up .230 and .239 ISOs in 2007 and 2008, he has dropped down to .201 and .175 respectively the last two years. Some of it may be from some normal fluctuation in his flyball percentage – though he hit a career-low 32.7% of his contact in the air last year, that number was 41.5% the year before and 36.7% in 2008. It looks like his speed is a little more dependable than his power because of this oscillation. It’s also a little premature to assume the 27-year-old Ramirez is in a decline phase. These two excellent shortstops will be leaving your draft boards early in the first round, and for good reason. A comparison seems to suggest that it’s a matter of taste: If you’d rather take a nudge in power and hope your shortstop continues to make an impact in the speed categories, Tulowitzki is your man. If you’d rather make sure to get close to 30 steals, and risk that the power is only OK rather than elite, then Ramirez is your man. You’ll probably be happy either way. Hanley Ramirez is a consensus Top-2 pick. Troy Tulowitzki’s in most people’s Top 20, and some people’s Top 10.
favorite among fantasy shortstop picks. In deeper leagues, you can safely ignore all of them. lot of hidden value in late rounds. solid enough defense to earn his team’s trust as an everyday shortstop. Cabrera will never be confused for a five-category beast like Ramirez. chopping the ball into the ground either. Cabrera sports an Average Draft Position of 249. But his B-Rank (Bloomberg Sports’ proprietary ranking of all players) of 190 demonstrates his significantly higher upside. cheap steals, could pay big dividends for your team this season. out Bloomberg Sports’ fantasy kits.